Published on August 2, 2008 in firefox. 0 Comments Tags: firefox. 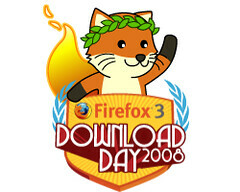 From 18:16 UTC on June 17, 2008 to 18:16 UTC on June 18, 2008, 8,002,530 people downloaded Firefox, which resulted in getting Guinness World Record for the most software downloaded in 24 hours. Please look there to see the map of Firefox downloads worldwide and read more about the Guiness World Record.